The Schizophrenia Research Foundation of India; the Southern Railway Ticket Reservation Centre at ICF South Colony, AnnaNagar; the Hitech Diagnostic Centre on Dr. Nair Road, T.Nagar, the Indian Bank ATM in Chetput opposite the KMC Hospital and Aavin Park, Adyar: this host of seemingly disparate landmarks in Chennai are unified by a single common attribute, which is the presence of a wheelchair ramp that makes these locations accessible even to the physically challenged. These and several other spots have been identified for compilation in a database on wheelchair accessible spots in the city, thanks to an innovative campaign launched by ConnectSpecial, a magazine in the making, which aims to bring together news and views facilitating the inclusion and assimilation of people with disabilities in mainstream society. 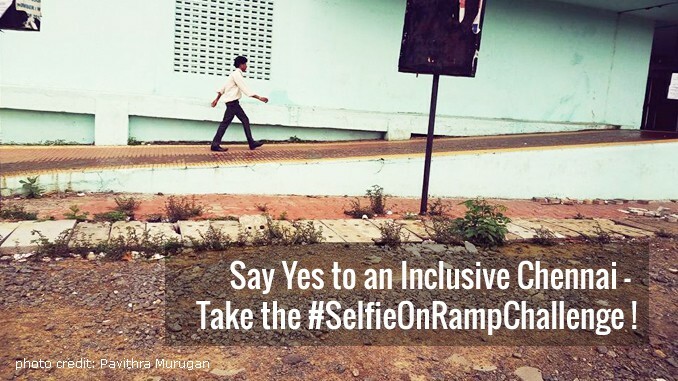 The #selfieonrampchallenge or #connectspecialphotochallenge invites Chennaiites to keep a lookout for places with wheelchair ramps in the localities that they live in or work or otherwise pass through. They could either click a selfie in front of the ramp or a photo of the location, and then post the information with the pictures on Facebook with the hashtags mentioned above. These can later be pulled and tagged for further compilation. “Our immediate aim was to catch the attention of a wider section of society and get them to be a part of the movement towards inclusivity by inviting them to do something easy and quick. That was the trigger behind the Facebook challenge. We wanted more and more people to think about ramps and their necessity, get these issues into their mindspace. This, we hope, will prove to be a crucial first step towards deeper and more frequent engagement with the inclusion movement” says Shashank R, one of the brains behind the campaign. The organisers and volunteers feel that more the number of people who can be engaged in the movement, higher would be the chances of positive changes at the levels of policy making and administration, leading to implementation priority. The second and longer-term objective is, of course, to build a data base of accessible places in and around Chennai that have ramps. Such information is not easily available at present and could go a long way in encouraging more outdoor movement and recreation for disabled people. While India has ratified the UN Convention on Rights of People with Disabilities, Indian cities have a long way to go as far as access to public places for people with disabilities is concerned. Access audits at different points of time by different NGOs in Chennai have clearly pointed to the gaps in infrastructure that impede the rights of disabled persons in the city. This was evident most recently during the Tamil Nadu elections, when half of Chennai’s polling booths were reported to be inaccessible for the physically challenged. Earlier in February, around 200 people with disabilities staged a sit-in protest in the city, outside the office of the Commissioner of Social Security. One among their many demands: the government should make public offices more accessible for them. In 2015, members of the community raised serious concerns about access issues in the Chennai Metro and the Disability Rights Alliance (DRA) sent an email and an extensive document to the Metro Rail authorities, detailing the problems identified during an access audit. In December 2015, the Indian government launched the Accessible India Campaign (Sugamya Bharat Abhiyan) for achieving nation-wide universal accessibility for persons with disabilities. Under the campaign, at least 50% of all government buildings in the State capitals were proposed to be made fully accessible for persons with disabilities by July 2018. All the international airports in the country and railway stations of A1, A and B categories would also be made fully accessible by July 2016. In addition, at least 10% of government owned public transport carriers in the country would be converted into fully accessible carriers for such persons by March 2018. Crowdsourced information and campaigns such as the one initiated by ConnectSpecial could go a long way in detecting gaps and enabling such holistic connectivity and access. “Thanks to the eager and positive response from people, we already have a solid database of about 35-40 ramps across Chennai. We will explore how this data can be shared and made useful for people with access issues, persons with disability, senior citizens etc. We may share it with any agency which is working on the Accessible India Campaign, or with government departments,” says Shashank. The data collected so far is publicly available on Facebook. One can access the pictures and location details using the hashtags #selfieonrampchallenge and #connectspecialphotochallenge. Going forward, the team plans to devise a system of classifying the data and storing it in a manner that makes it possible to search according to a specific area or location.